and we have a couple of stamps to tie into some of our spring embellishments coming soon. I was so excited to open my box from Emerald Creek this month to find some amazing new stamps and the most beautiful stones along with new-to-me Onyx Frost Embossing Powder. Right away, I knew I wanted to try my hand at an organic abstract canvas. I used texture paste, crackle paste, grit paste and embossing powders to get this rich stone like texture. Adding some background stamping, (using Kim's new shell stamps) and those glimmer-y new stones added even more texture to this abstract canvas. Please click on my name above, if you would like to see some close ups and a step-by-step tutorial. I went to Munich last November with my son and husband and we visited the treasury in the beautiful residence. 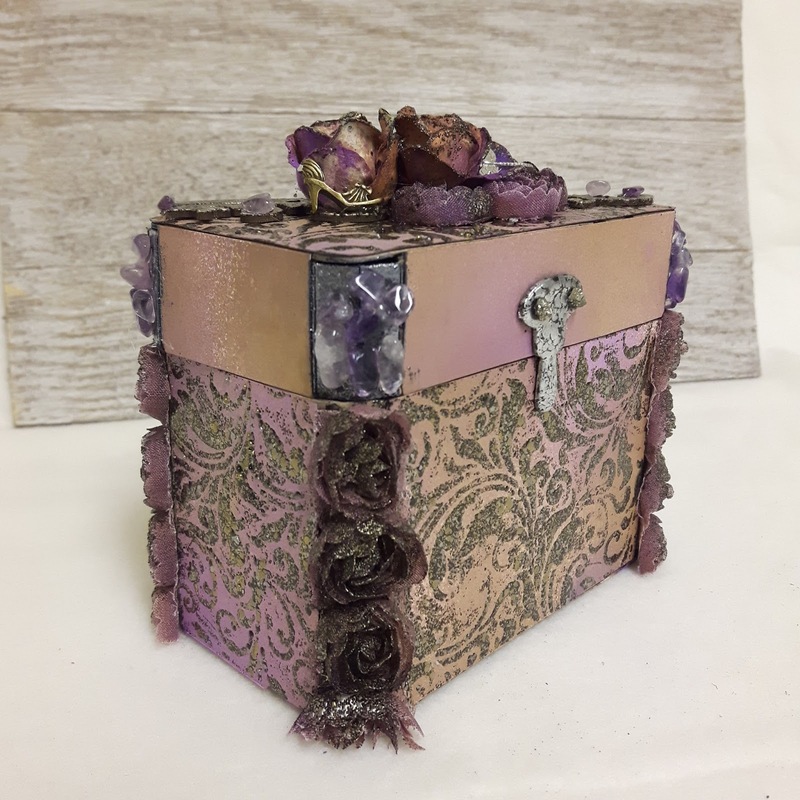 They have a lot of old crowns and other treasures made of gold and jewels on display and when I received my last DT parcel with the wonderful gemstones in it, I knew immediately that I wanted to create my own treasure chest with loads of gold and jewels on it. The fab Emerald Creek embossing powders were just perfect for creating the gold and metal look on the chest's lid and metal fittings! 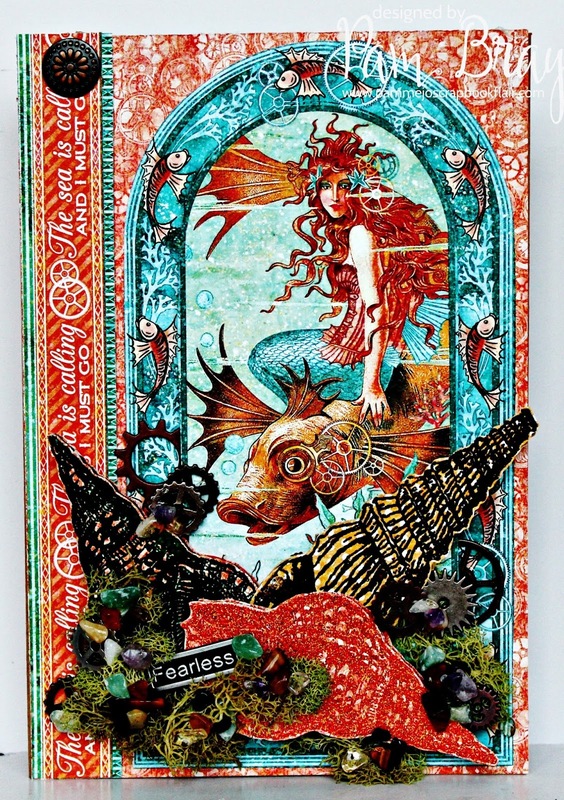 This week, Creativation (formerly known as CHA) is in Phoenix AZ; it is one of the largest Craft and Hobby Shows out there. We are all very excited with the new products that Emerald Creek Supplies will be debuting at the show. I know I was super excited when I received my design team box! 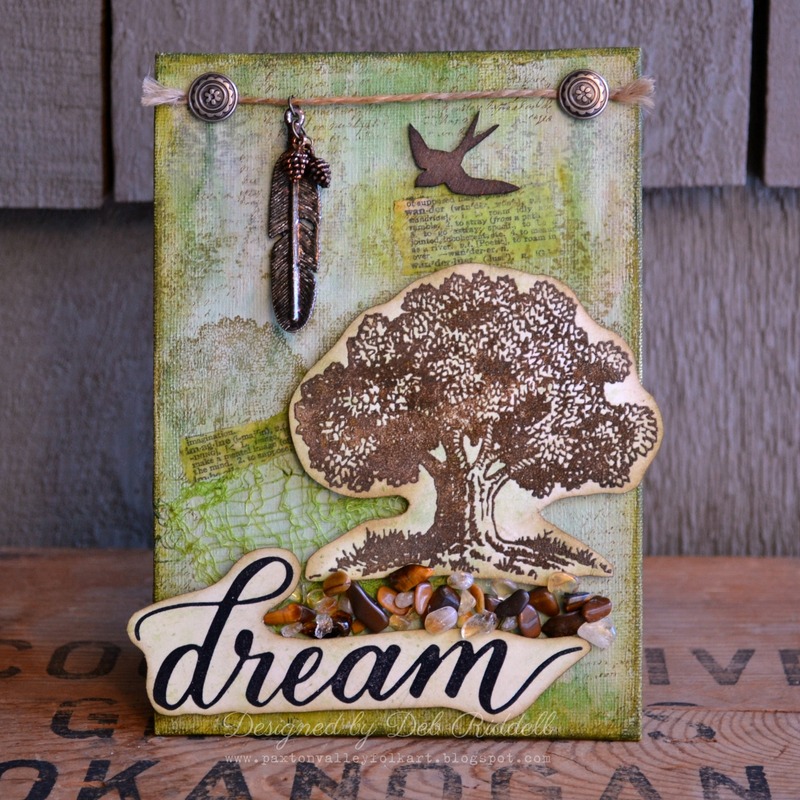 It had some of the newest stamps, charms and a fabulous batch of Mixed Media Stones that will be available soon in the Emerald Creek Supplies Store. Today, I am sharing with you my "Fearless" Card using the two new Seashell Stamps and Mixed Media Stones along with the amazing embossing powder that Emerald Creek Supplies manufactures. It was a sentimental time for me while I created this layout, not only because the photos are special, but because this will be my last project with the Emerald Creek Design Team! I look forward to future collaborations and I am so excited for Kim and her CHA adventure this month! She has release some fabulous new products and I especially loved playing with her new Quarry gemstones! They are stunning and there is such a wonderful selection! I was incredibly inspired by the stones and the ocean themed stamps, so I decided it was the perfect time to scrap some beach photos! Please check out my process video of the whole layout here! To enter this month's Bring On the New Dare, use the InLinkz below. Remember to follow the challenge rules as posted on the right sidebar of the blog, in order to be eligible. It's Going to be Hot at Emerald Creek for 2017! We are crossing over some crazy boundaries this year and we want to start featuring the products being released at the Creativation show for CHA2017. First up is our newest releases landing in the ec Quarry. Check out these lovely gemstones. Packed with brilliance and meaning, these are sure to bring a new and wonderful impact to all of your projects. Now to see all of the amazing pieces that our DT has showcased for you. We have the team split in 2 and Team One, featured today, were the winners of our CHA draw back in the summer and will be onsite at the show, teaching and working in the Emerald Creek Booth #1930. All of these pieces will be on display and if you are at the show come and say Hi to these amazing women. Once you have seen all of these projects, join us on the challenge featuring all products that are new to you. One of the best things in life is when the FedEx truck pulls up to your house. I had been anxiously awaiting my package from Kim to see what Emerald Creek has in store for all of us and you will be amazed!When I saw the new stones I knew I had to make beautiful mermaid jewels with them. It was with great anticipation that I awaited the arrival of Kim's parcel containing some of her new releases for Creativation 2017 and as always I was not disappointed! 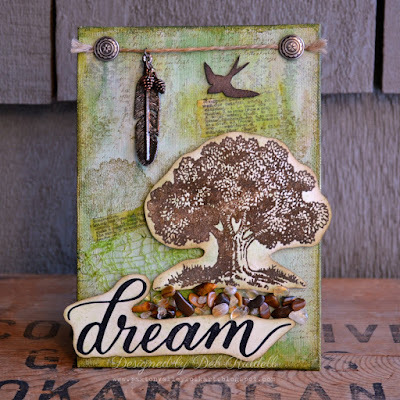 It won't be any surprise to Kim that I immediately pounced upon her Oak Tree stamp (both the large cling mount and the smaller wood mount versions) and combined them with those fabulous new art stones. 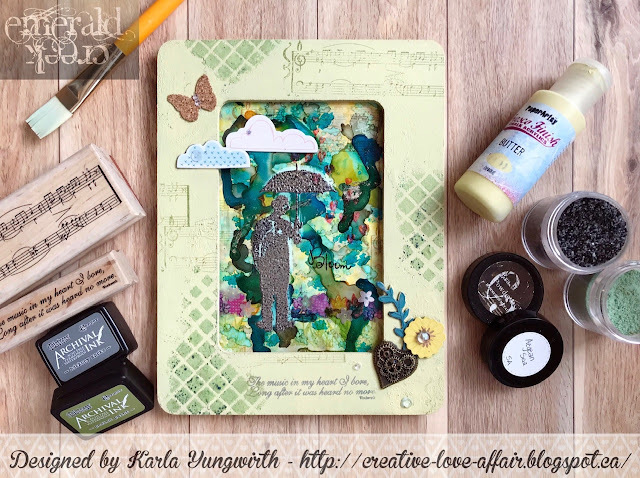 Kelly Klapstein's lovely Dream calligraphy stamp and some of my tried and true favourites from Emerald Creek were also used to create my Dream of Nature canvas. I've some close ups on my blog, hope you can stop by to take a peek! I can't believe how exciting it was to see some of the new products coming from Emerald Creek! 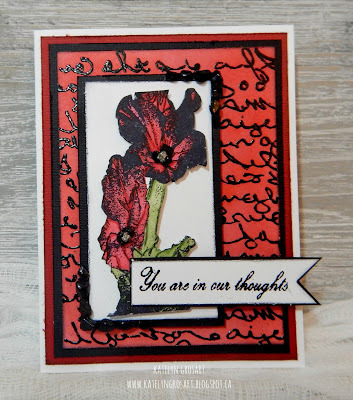 I think we all know by now how much I love embossing again thanks to the incredible custom blends that Kim creates. I was embossing like a crazy person and loving it. I have close ups and more details on my blog, so hop on over and see some of the new products. I am excited to make my first 3-D project and my little trinket box had to be purple jewel encrusted! Creativation is only a few days away and that means new products from Emerald Creek Craft Supplies! 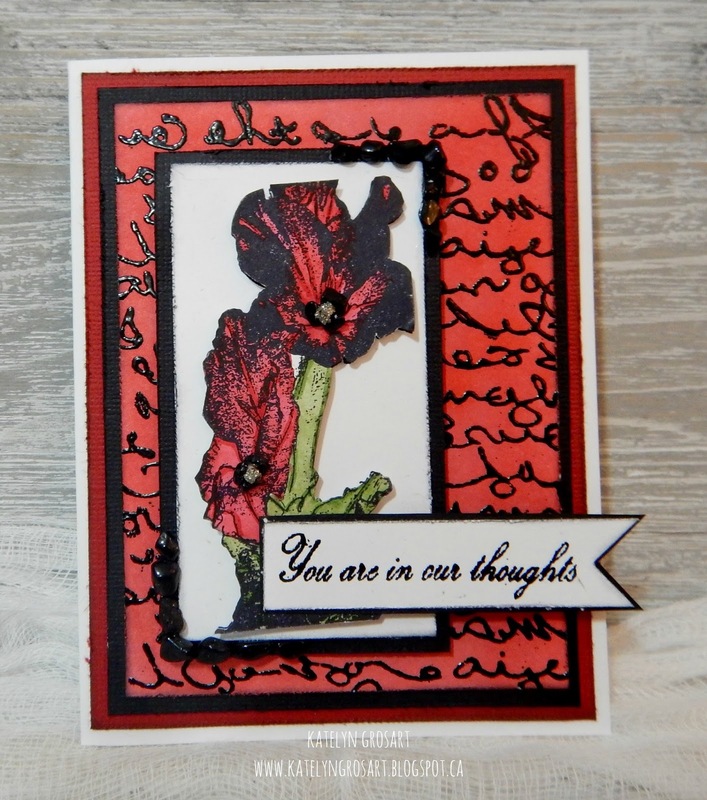 Kim asked me to use the new Gladiolus stamp (coming soon), which I love, but at the beginning was a bit challenging for me. Once I started colouring the flower and adding the new stones to it, the Gladiolus image was the perfect addition to my sympathy card turned. 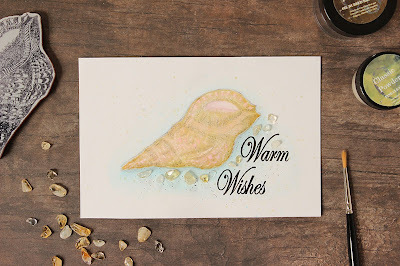 I invite you to head over to my blog for a tutorial and some close up pictures of my card. With a new year comes a new release of creative goodies to play with here at Emerald Creek. For my multi-occasion watercolour card creation, I went on a little adventure across the new lines... I frolicked in the "Reef", I dabbled in the "Mill", and I contemplated in the "Quarry". For further details, come on over to my playground. and I am working on posts like crazy. This one is for the amazing Canadian shop Southern Ridge Trading Co (SRTC). Their new challenge is up and it's all about winter. I made a couple of cards this season using a couple of my favourite SRTC chipboard pieces. The first of my faves is the Small Snowflake Wreath. I quickly painted them up with Tim Holtz Picket Fence acrylic paint dabber by Ranger. Then, I dumped the Fractured Ice embossing powder by Emerald Creek onto it. I heated one partially to create ice crystals. It's an amazing effect and the chipboard really holds the half melted powders well. To others, I went for the full melt giving them the perfect glassy glacier ice look. Here's a shot of the 3 stages all were perfect for any card. Then, I quickly added paste to a snowflake stencils with my finger so I could control which snowflakes received the paste. Adding a little bit of the Soft Fallen Snow embossing powder (also by Emerald Creek) and heating it made them puff up perfectly. You seriously have to try this powder and technique! The second SRTC chipboard piece that I am in LOVE with is the Retro TV. I grabbed some Candy Orange embossing powder, and covered the body of the TV. Don't miss the edges and for the best result use the Ranger Emboss It Dabber (SRTC also carries this by special request). Then, I used a block felt to colour the cardstock underneath and the Charred Gold embossing powder (not online, but SRTC does carry it, just email about it), to create the knob buttons and cover the legs. and randomly dry sprinkled over the patterned cardstock and word tag and then heated from underneath (no ink was needed). I had printed my favourite scene from the Rudolf Christmas Movie, black and whited it and dropped the greys and then coloured up the characters with my Tombow Markers (coming soon to SRTC for a limited time). My mind is reeling with ideas for this TV and it is a must have. Because this is a Southern Ridge Trading Co. post, I will not have links to any of my products. Southern Ridge carries some and I strongly encourage supporting them. Please click Here for the SRTC Shop. It's 2017 and that means we all have some new goodies to play with or to share. Let's see what you create with your 'new to you' products. Today, I am leading off the new challenge, the new year, and the new product release peaks on my own with the 40 to 40 post # 4. This Christmas, my kids and I were at a PM Hobby, here in Calgary. My son spotted some wooden swords and started playing around and as I checked out the styles, I was take with a battle axe and buccaneer sword while my son was set on the knight's sword. The moment I saw these I thought about creating some embossing powder magic! First, I gave the sword a quick sanding to really smooth it down. Then, I went straight for my Ranger Ink Emboss It Dabber, Hammered Metal embossing powder, and Milwaukee heat tool (now Wagner brand). I heated and layered the hammered metal. (I had to leave the sword a couple of times to cool off because I was afraid the wood would catch on fire it got so hot). This is a quick angle shot. If you half heat the powder it makes a cool rough pebbled texture. Then, I added Gun Metal and Enhanced Silver Pearl embossing powders to the area where it would have been sharpened. Then, I moved to the handle and grabbed my Charred Gold Powder. I had to apply the Emboss It ink with my finger at one point because the grain and inside curves needed a heavy coat so it wouldn't soak in. It's a really great ink because it not sticky and it smells great. Now for embellishments. First, some wire twisted around the bottom of the handle. Next, some leather, but I couldn't find mine. So I pulled a string from a burlap sac from Christmas gifts and grabbed the Candy Brown embossing powder and thoroughly coated it. Because the plastic powder made is stiff, I used my 400 grit sandpaper and sanded it down lightly to smooth it and give it some flexibility. I tied it around the handle like a grip. I glued red jewel brads to the display hole at the end to cover it, using the beacon 3 in 1. I didn't have time or patience to deal with hot glue. I hope you enjoyed reading the steps to creating this sword as much as I did making it. If you are at Creativation in Phoenix, it will be on display in Booth #1930. Come see the projects and a bunch of the Design Team. Winter Wishes Dare with her Winter Wonderland Tags entry. 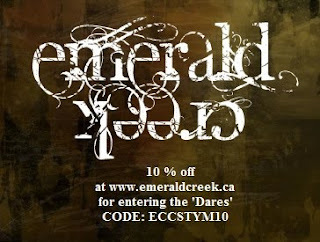 Georgie, please email Kim at info@emeraldcreek.ca for your prize code. To enter this month's 'Bring on the New' Dare, use the InLinkz below. Remember to follow the challenge rules as posted on the right sidebar of the blog, in order to be eligible.